That is correct: Bacon of the Month Club shipment No. 2 is here. This one is Burgers' Smokehouse "Sliced Country Pork Jowl." It comes to us from the curiously named California, Missouri. Being face bacon, rather than belly bacon, I suppose it's akin to guanciale, the mythical product that Mario Batali has been espousing for so many years. What I notice is that it's nearly pure fat, with very little meat. This is no bad thing. It's a cooking tool like any other, and I can see it as a sort of "final jammies," wrapped around so many different grilled foods, basting them while protecting their tender flesh from direct heat. I think of using it like caul fat, like the fancy fellows do on Iron Chef. To hold things together. Will I finally buy a weird little frozen quail? Will I finally do a scallop wrapped in bacon? I think all of these horseshoes are at least leaners. I've only had a small sampling of Burgers' -- my typical "control group slice," done plain in a pan. It was pure fat, without any streak of meat, though most of the rest of the package does have a pencil of pink in it. It's nothing like Father's bacon. Tasting it does not bring to mind scenes of a randy redneck taking advantage of Ned Beatty in the woods while a cross-eyed hillbilly plucks a banjo on a porch. This product has none of that dense hickory perfume, and is just itself, pure pork essence. It's a much more subtle flavor. I'll keep you posted. As ever, thanks for the recipes and techniques that continue to flow in. I read them all, and mull over them, and on occasion have even had them recur to me as I stood in a line or waited at a traffic light. 1) People from England who have travelled in the United States uniformly assume that all of us cook our bacon into bitter little dry, hard strips at every opportunity. They think that if we come to England, we will break into their houses while they are away and cook all their bacon until it snaps when you drop a pencil on it. They think we sneak away from our own college graduations to ruin bacon in a van parked behind the stadium. How wrong they are. How strong their own country's bacon propaganda machine must be. 3) Black-eyed peas. If there is one treat that takes me back to my childhood kitchen with high-grade ballistic precision, it is black-eyed peas. Pair them with a butter-topped pile of steaming white rice and the only thing missing from that youthful, sensory triumvirate is the time I saw my half-naked, senile old neighbor mowing his front lawn with a load in his shorts. 3.1) In (3), I originally intended to thank the fellow who wrote in with the Hoppin' John idea, but "the tale grew in the telling," as they say. That's where I was going with that black-eyed pea angle. You may as well know the truth. After last I wrote, I had already dispatched the remaining four slices of Father's hickory-smoked bacon into the great gullet that spells end-of-days. I hid that information from you, as a writer. I knew I was doing something wrong, or at least disingenuous, yet still I carried on; I felt as though the greater time I afforded myself to come to terms with Father's final application, the more adequately I could convince you of its ultimate appropriateness. After last time's egg-and-lardon salad, as you know, I had four slices of this supremely smoky bacon left. It was getting close to three weeks, and despite my best efforts, Father's bacon wouldn't last forever out of the deep freeze. I had to act quickly, and I did. With an inbox full of roasted butternut squash risottos and bacon-wrapped quail in mustard pesto, I did the unthinkable one morning, when no one was home. I cooked the slices until tender, spread seasoned mayonnaise on two toasted pieces of bread, and set the bacon on a book-matched bed of cool, crisp, tender romaine hearts. A flash of the blade down the middle and there I had it: a thick, smoky bacon sandwich without much in its way. Father's had a lot of personality — it was a cigar in a room full of dippers, a Stetson in a sea of beanies. As I wound down my trials with this first shipment from the Bacon of the Month Club, I didn't feel bad to use it this way. I feel I was lucky to grasp the essence of this particular meat just in time: that it was strong enough to stand on its own. If a slice of steamed ham is Liberace, with his wardrobe of lettuces, onions, pickles, sauces, cheeses, and fridge-ripened tomatoes, Father's was every bit a dying man with a wooden guitar, alone in the back seat of a Cadillac, the one who didn't need to dress up to say goodbye. Next Time: New Shipment! 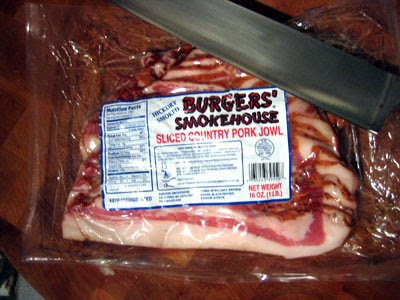 "Burgers' Smokehouse Sliced Country Pork Jowl." First impressions of pork face fat quality, tasting, and rumination. Includes centered photograph. Time's running out for Father's Bacon, what with the next mystery shipment of pork hitting the vans today (I get an automated email letting me know that I had better be home or call in to the mothership if it's going to be otherwise). I've got four thick slices left after tonight's modest success, and I think maybe I'll even ask for a professional opinion as to what to do with them. There — any professional cooks out there? I've read and considered every recipe the readers have sent in, but these (with absolute respect to all contributors, and I hope to hear from more of you) peaked at wrapping a hot dog in bacon. Sure, on paper—technically—it's a remarkable achievement of charcuterie, but I feel like something as transcendent as smoked pork ought to do more than adorn an already-tasty hot dog. It ought to elevate something in need of its bountiful charity. Foraging around my mental gallery of germane recipes this afternoon (price of admission: honor system; take one of the Chinese delivery menus I pretend are brochures), I considered the workhorse bistro salad of frisée with bacon and poached egg. Dress the lettuce, toss it with some lightly-rendered bacon and croutons, and drop a poached egg on top. How could you not like that? You would be a crazy fool with a nugget of cocaine under his eyelid if you tried to act like that would not be delicious. Like a beaming grandmother who sprays perfume at an asthmatic infant whom she hopes to mold in her image, I put the bacon slices down to cook whole. After a fashion, something told me that a chef with a thermometer in his tricep pocket would have cut the bacon into its little lardons (French for "lil' lardy-bops") first. Something about edge texture and more attractive finish. I removed the meat from the pan and quickly dispatched the strips into 1/2-inch bits before returning them and finishing the render. Meanwhile, I got an egg poaching. I tossed in some vinegar to help the egg bunch together and look lovely, but I used red wine vinegar (even though I was only making dinner for one person, I made a lot of hack mistakes like this). The top half of the egg wound up with some pink discoloration around it, so at the end of the thing I plated it upside down on the lettuce (and attempted that deft food photographer's slice, the one that frees a nice little rivulet of ooey-gooey yolk). When the bacon was done, I turned it out onto some paper towels and poured the grease into a can of Coca-Cola Cherry Zero (I will make sure this subtle nuance is in the final recipe). The pan had two great fond-outlines from the original strips, and the crouton cubes I'd set to brown in there didn't scrape them up, so, once the croutons colored, I dumped them into the frisee and poured my dressing into the pan to release the chewy brown outlines. I'd never done a functional warm dressing before. It was exciting; I felt like a person with red pants on. I felt like a person with red pants who becomes something better than himself because of the pants he is taking a chance on. I'm sure you have all been there. In all, I was glad to find myself returning to basic dishes. When you taste this bacon, you don't sit around talking about redolent wisps of deprecated hyacinth, or tumescent campylobacters (like with most bacons, I'd guess). After my first bungling tribulations with the first bacon of the Bacon of the Month Club, I've arrived at a plump little maxim: "it's bacon, not paid-by-the-word hackneyed Victorian food writing." Bacon is simple, like a man smoking a cigarette on a train platform in Budapest. He doesn't need you, and he doesn't care if anyone cares about you. He's perfect at what he does, which is make everything porous smell like him. If a wolf ate him, the wolf would be named after him. The wolf would stink forever, and no hunter would place much value on his pelt. Next time: putting Father to rest.